If you've got lots of pre-cooked leftover rice and want to make rice pudding, try this easy leftover rice pudding recipe baked in the oven and made with milk, rice, eggs, sugar, and vanilla - and that's just about it! This is a decadent and creamy rice pudding recipe that you can serve either as a sweet breakfast or for dessert, and it is very easy to prepare: Just mix and heat everything together stove top, then stick it in the oven for about twenty minutes or so. Rice pudding is a great way to use up all your already cooked leftover rice. This rice pudding recipe, made from leftover cooked rice is vegetarian and gluten-free. Because this recipe calls for both eggs and milk, however, it is not vegan. If you need it to be dairy-free, however, you can always swap out the milk for any non-dairy milk substitute, such as soy milk, almond milk or even coconut milk. First, pre-heat the oven to 350 F.
In a medium saucepan, heat the milk and rice, stirring together frequently so that the milk doesn't burn. Bring the mixture to a slow simmer. In a separate large bowl, combine the eggs, sugar, and vanilla. Add this egg mixture to the hot milk and rice and allow to cook for just a few minutes, stirring occasionally. Stir in the cinnamon and raisins, stirring just to combine well. 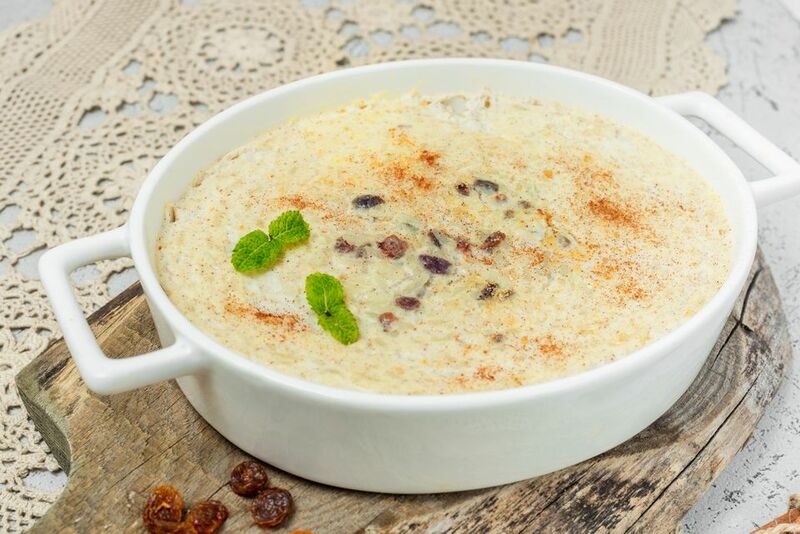 Finally, pour the rice pudding mixture into a casserole or baking dish and bake in the preheated oven for 20 minutes. Allow your rice pudding to cool slightly before serving. Though rice pudding is usually prepared with leftover cooked white rice, you can use any rice you'd like or happen to have leftover (brown rice, or basmati rice, for example). However, note that wild rice is not actually rice, and shouldn't be used to prepare rice pudding as it won't cook up in the same way. If you'd like, you can always sprinkle the top with a little bit extra cinnamon, brown sugar, nutmeg or even a touch of cocoa powder or pumpkin pie spice blend. Other spices which might be interesting? A touch of rose water syrup, some fresh cardamom pods for an Indian-style "kheer," or a touch of fresh lemon zest. Yum!